and storage high power tubular batteries. It is an economical and pollution free independent solar power plant having no need of grid or external power and this can be installed anywhere there is sunlight without any licence or permission of the local body or the Governnment and the Ministry of natural renewable energy (MNRE) provide subsidies for this project.Being the pioneers, we have made a place of our own in the field of solar based power units since our installation in 2000 and have done thousands of solar power unit plants in many places including The Agricultural University, Malapuram, Government of Kerala, The CISF 7th battalion military camp, International Airport, Karipoor, ISRO Sreeharikotta, Marine Fisheries Dept of India, Vallarpadam Container Terminal (IGTPL) TCS Info Park Cochin etc which are only a handful among our highly reputed clients in addition to a lot of other private organisations.. In order to avoid some unpleasant situations and for the smooth functioning of the system it is strongly recommented that the services of a qualified and experienced technician is sought without fail. ► Pure sine wave out put. ► ISO: 9001 -2015 Certified solar power conditioner. ► IGBT with German PWM intelligent charging technology. ► Work with solar power, the best way to save money using natural resource. ► Attractive Designs. ► Pollution free type. ► Single Switch Operation. ► Fully automatic. ► IGBT based topology. ► Protection from lightening. ► Over Load Protection. ► Over Charge and Deep Discharge cut off. ► Independent Digital display inverter input and output voltage, load, etc. ► Audio and Visual Indicators. ► Can connect to the existing wiring. ► No husking sound. ► It is a fully automatic built-in charging control or external system, No need of any manpower. ► Provisions for connecting grid power. ► Optional mains charger ON/OFF switch. ► Back-up power support. ► Option for customization of back-up power. ► The Special feature of the system is when we connected to main line - if the battery is full and there is sufficient sunlight the system will automatically cut the main line off (KSEB Line) and connect the solar system. ► Our built in solar charger is floating type and once it fully charges the battery, it gone to trickle charging. This will provide more battery life and can utilize 100 % efficiency of solar panel power. ► An ideal unit for day and night power supply. ► Micro controller base digital accuracy. ► PWM base high frequency charging mode. ► Zero drop charging for maximum efficiency. ► Automatic temperature compensation. ► Suitable for all type of battery. ► Fully automatic operation. ► Electronic protection. ► IGBT base switching for long life. ►No required reverse diode. ►LCD display for all parameters. ► Manual test capability (custom). ►Auto sensing day & night charging mode. ►Efficiency up to 87%. ► Auto detect mains & solar charging mode. ► Automatic dust tone controller (custom). ►Over load short CKT protection. ►100% over charge protection. ►Automatic select battery cut off level for connecting all type of battery. System priority Stage : solar-battery-grid 1) When solar energy is sufficient total out put load will operate on solar Inverter. Excess solar power will charge batteries. 2) When solar energy is weak then inverter is taking DC source from batteries to compensate the out put load. 3) When the battery discharge level reaches 11.2 volt or below the out put load is shifted to grid. 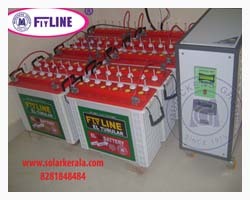 4) At Day time again each battery become 13.5 v the output load again shift to solar Inverter. 5) At night or when there is no sunlight the batteries reach 70% discharge level (30 % kept as a buffer) the out put load is shifted to grid. (Each battery discharging level become 11.5 v ) 6) After shifting load to grid the batteries are charged from solar energy and if solar energy not sufficient to charge the batteries, then there is an optional on –off switch ( manual ) to charge the battery from grid up-to 12 volt and full charge volt of 13.5 in each battery . 7) By using solar power the solar charger high cut-off is 14.5 V of each battery. 8) At night During changeover of load from battery backup to grid supply (i.e 70 % battery discharged) and if grid supply is absent then load is shifted to solar inverter to use buffer battery backup (i.e balance 30 %) 9) When grid returns during which inverter is working on buffer battery backup then the load is shifted to grid & batteries are charged through solar or grid as per logic explained above. 2. Oil Cooled Voltage Correction 35V/Sec. 18 Solar charger-built-in Floating type & Trickle charging. Floating type & Trickle charging.